The main objectives of the Protein Research Foundation (PRF) are to replace imported protein used in animal feed with locally produced protein and to encourage the better utilisation of this protein. The objectives are promoted through research funding and technology transfer. 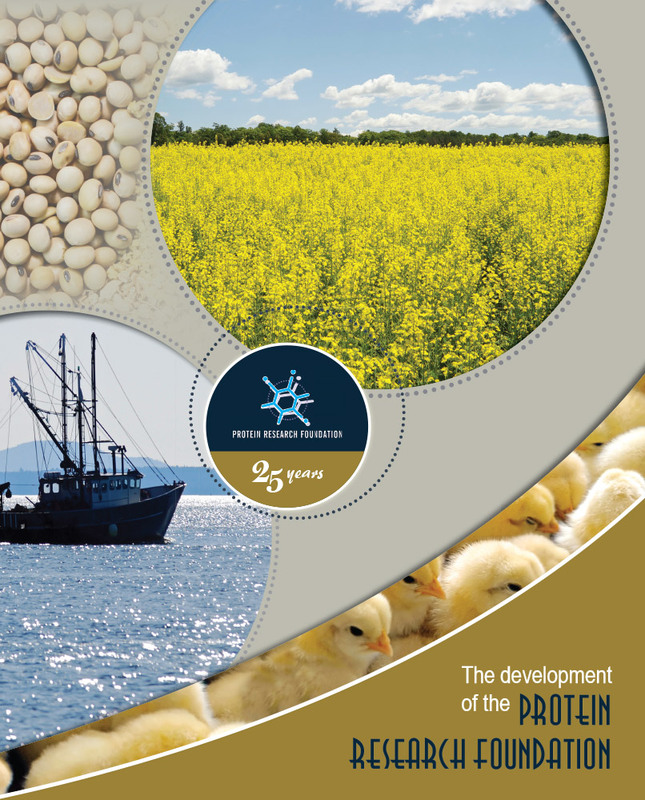 Funding is available for research on appropriate protein crops, oil seeds and other protein sources and to improve the efficiency of utilisation of these proteins in the livestock, poultry and aquaculture industries in South Africa. Die Proteïennavorsingstigting (PNS) se hoofdoelstellings is die vervanging van ingevoerde proteïen met plaaslikgeproduseerde proteïen, asook die beter benutting van proteïen. Hierdie doelstellings word bevorder deur die be­fondsing van navorsing asook tegnologie-oordrag. Navorsing word befonds ten opsigte van die toepaslike verbandhoudende gewasse, oliesade en ander proteïenbronne asook die aanwending en be­nut­ting daarvan deur die belangrikse akwakultuur-, dier- en pluimvee­spesies eie aan die Suid-Afrikaanse mark. Soybeans are a main part of the diet of the Japanese. It is believed that this accounts for the fact that Japanese women have been shown to have low rates of breast cancer, osteoporosis and menopausal problems. In menopausal years, when women's oestrogen levels are low, the isoflavones found in soybeans, act as oestrogens relieving hot flushes, mood swings and reducing bone loss. In contrast, when women's oestrogen levels are high, the oestrogens in soya help lower pre-menstrual stress. Soybeans have been called "meat without bones" because, although this versatile bean is small in comparison to many other beans, it is packed with protein, very similar to the protein in meat, dairy products and eggs. The soybean plant is one of the few plants that provides nearly all the essential amino acids, that make up proteins. that scientists from the Agricultural Research Service, Iowa State University and Brazil have identified a cluster of genes that provide resistance to the soybean rust (SBR) fungus (Phakopsora pachyrhizi) ? In addition, these researchers have been involved in the largest molecular study of SBR over the past three years by narrowing the field of 37,500 genes involved in defending the soybean plant against SBR, to just a few hundred. Research is currently underway to study these genes experimentally to understand their roles in controlling the rust fungus. One serving of canola oil each day will deliver about a quarter of all the vitamin E you need to protect your body's fats and proteins from free radical damage. Vitamin E may also help reduce the risk of heart disease, cancer and memory loss. in Brazil, about 25% of cars run on biofuels (mostly sugar and soybeans). Studies have shown that soya protein is 13 times more energy efficient than organic dairy protein. The main health benefits in eating soybeans are from the various phytonutrients they contain, e.g. isoflavones. These have been shown to help prevent cardiovascular disease, certain cancers, osteoporosis and other conditions. In 1999 the Federal Drug Administration in the USA approved the health claim that the heart health benefits of soya could be used on the labels of soya-based foods. Japanese men are known to have the lowest rate of prostate cancer in the world, but research has shown their rate of prostate cancer increases when they immigrate to the US. Genetics and a westernized diet may have a role to play in these health differences, but substantial medical research has shown that the addition of soya in a diet plays a large role in alleviating prostate cancer. that the soybean genome was recently sequenced by the US Department of Energy and several academic laboratories? This major scientific breakthrough will enable plant breeders to breed better, more adaptive cultivars with higher yields and increased resistance to biotic and abiotic stresses. Cholesterol is a soft, waxy substance present in all parts of your body. There are two sources: a) cholesterol made by your liver and b) cholesterol that you eat in animal products such as eggs, meat, poultry, fish, dairy products, butter and lard. Canola oil is cholesterol-free. in a recent study it was shown that women with breast cancer who included about two servings of soya protein per day, had a 7.4% mortality rate and an 8.0% cancer recurrence rate. In comparison, women with breast cancer who consumed less soya had a 10.3% mortality rate and a 11.2% recurrence rate, i.e., about a 30% decrease in risk of mortality and recurrence in breast cancer patients. in the US, conservation tillage is used in more than 65% of the country's soybean production areas, resulting in a 93% decrease in soil erosion, a 70% reduction in herbicide runoff, and a 50% reduction in fuel use. Canola oil is pressed from tiny canola seeds produced by beautiful yellow flowering plants of the Brassica family. Cabbages and cauliflower are also part of the same botanical family! Canola was bred naturally from its parent rapeseed in the early 1970s. Canola, however, is NOT rapeseed – their nutritional profiles are very different. with the worldwide emphasis on environmental conservation, soybean based candle wax is offering an alternative to petroleum-paraffin waxes with additional advantages such as enhanced fragrance holding ability, improved pouring characteristics and easier use in existing candle manufacturing factories. Your body needs fat – to keep you warm, provide energy and help you absorb fat-soluble vitamins and carotenoids. The National Academy of Science Dietary Reference Intakes, developed by Canadian and American nutrition experts, recommends that fat provide between 20% and 35% of total energy intake. But some fats are healthier for you than others. Canola oil provides more of the good fats than any other popular vegetable oil. over the past 12 years, crops improved through agricultural biotechnology, have produced more nutritious and higher yields and consequently higher profit margins. In the history of agriculture, no other advances have been adopted as quickly. In addition, through the use of these crops, the US has decreased carbon dioxide emissions equivalent to removing 6.3 million cars off the roads. These findings show that biotechnology is safe, contributing to increased human health as well as environmental and agricultural sustainability.